We have had a visit from James Dawson, a freelance documentary producer, who is making a film about the decline of the English parish church organ and its culture. He came to film an organ builder making things. 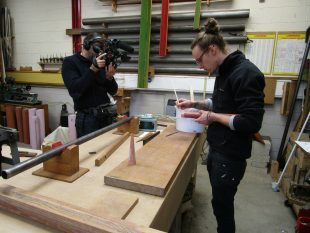 Here Joseph is making him a sample metal pipe which Edward later voiced, with James filming the whole process.